The Hungarian Ice Hockey Federation celebrated the sport of ice hockey with a star-studded gala event that consisted something for everyone. The Hungarian Ice Hockey Federation celebrated 90 years of ice hockey with an event that had a kids’ ice hockey tournament, a women’s game that pitted the national teams of Hungary against Poland. There was an “old boys” game that had the 2008 IIHF Ice Hockey World Championship’s Hungarian team that won promotion to the top division against the Finnish “Golden Lions”, that was largely made up of players from the 1995 World Champions. The final game was the Hungarian men’s team playing Poland. The guest of honour was Vladislav Tretiak. 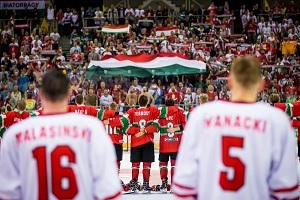 “The Hungarian Ice Hockey Federation has done great work,” Tretiak said. “The fans are great and we are all familiar with the work that Dr. Zsuzsanna Kolbenheyer has done.” Tretiak and Kolbenheyer know each other very well since both are IIHF Council members. The women’s team set the tone for the celebration as they defeated Poland 8-1 thanks to Alexandra Huszak’s hat trick. The game was tied early but Hungary pulled away in the second half of the game. For many fans the biggest treat of the gala event was seeing players such as Balazs Kangyal, Levente Szuper and Krisztian Palkovics go up against Jere Lehtinen, Niko Kapanen and Reijo Ruotsalainen. This might not have had the same pace if it was played 10 or 20 years ago but it was still exciting for both the players and the fans. Hungary had a 2-0 lead after the first period and were up 5-1 at one point before Finland came back, but Hungary hung on for the 6-5 win. Former Hungarian head coach Pat Cortina had a blast coaching his former players again. “It is always special to be back and it feels better the older I get. There are great people here and the team is a group of unbelievable guys. It was a great atmosphere and everyone had fun,” the Canadian said. Jere Lehtinen has become familiar with Hungarian hockey the last few seasons as the GM of the Finnish national team. “For me it was great because I had a chance to see the Hungarian fans again who were the talk of the World Championships in Russia two seasons ago. Actually Finland played in Hungary last year, so this is the third year that I have had a chance to see these great fans,” he said. The gala came to an end with the Hungarian men’s national team taking on Poland. Both teams named new head coaches who were making their coaching debuts with their teams that will battle for promotion to the top division next April at the 2018 IIHF Ice Hockey World Championship Division I Group A in Budapest. The visiting team Poland had Ted Nolan with Jarmo Tolvanen behind the bench for Hungary. After a scoreless first period the floodgates opened up in the second period in great delight for the fans. Hungary jumped out to a 4-0 lead thanks to a pair of goals from Brance Orban with Poland ending the shutout that David Duschek had going in the final minute of the second period. The final score was 5-1. “We want to thank everyone that came out to the Laszlo Papp Sportarena. I am sure the highlight was the chance to see the ‘Sapporo Heroes’ back on the ice. It was great to see the stands full with fans who created a great atmosphere in the arena,” said Gergo Nagy after the game. Hungary has had an extraordinary 90 years of ice hockey with ups and downs and will hopefully see new highlights during the next 90 years.